1921, Aug 16 Documents surrendered; "vessel abandoned". 1866, May Boiler expolosion off Middle Island near Alpena, MI; cargo lumber. 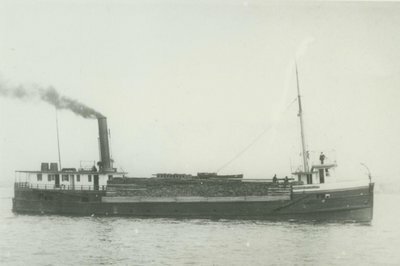 1880, May 1 Owned Jesse H. Farwell et al, Detroit, MI; converted for sand trade; changed to propeller; 447.1 gross tons; 2 masts; engine steeple compound, 19 & 36 x 36"; 280hp; 80rpm; built 1865 by S.F. Hodge & Co; firebox boiler 8' x 16'; 90#; by Detroit Locomotive Works(1880); 2 masts. 1881, Mar 14 Owned George Prentis, Detroit; 447.1 gross/356.69 net tons. 1883, Sep 15 Owned H. Howard, Port Huron, MI; 1 mast. 1884, Apr 30 Owned E.C. Recor et al, St. Clair, MI. 1892, Apr 15 Owned W.E. Rice, Harbor Beach, MI. 1898, May 22 Aground Pipe Island near Detour, MI; released by tug MERRICK. 1900, Feb 5 Owned Mary C. Rice, Harbor Beach, MI. 1904, Jun 15 Owned L.P. & J.A. Smith, Cleveland, OH. 1906, Jul 3 Owned Cleveland Dredge & Dock Co.
1906, Aug Crippled when tow broke while towing barges WILLIAM GRANDY & AGNES POTTER off Euclid Beach near Cleveland; both barges grounded. 1907, Mar 5 Owned Great Lakes Dredge & Dock Co., New Jersey; registered Duluth, MN; sand & gravel carrier.